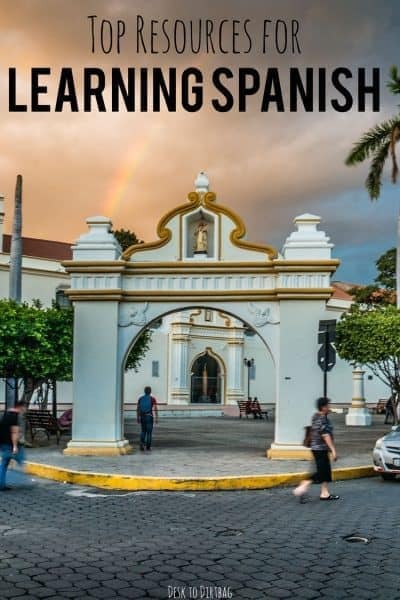 In this post, I want to talk a little bit about the best resources for learning Spanish, the sorts of tools that I know, use, and love–those that have truly helped me with my Latin American Spanish language skills both prior to heading to South America and while continuing to learn here. I love foreign languages. I love learning new things and new ways of communication. You can read study after study that touts the benefits of learning a foreign language, no matter your age, for improving your cognitive function to staving off Alzheimer’s, and more. Plus you open up a whole new world of travel, communication, food, culture, movies, media, and music. Everyone should learn another language, especially those of us from the United States that tend to be so averse to this idea. I’ve studied Japanese, Russian, French, Italian, Portuguese, and Ukrainian at various times and to various levels of proficiency. I majored in Arabic and Middle Eastern Studies and lived in Yemen for six months. This is all to say I’ve spent a lot of time with different languages, different resources, and different methods of learning (from classes to self-education to informal tutoring). For some reason I never took Spanish. The most useful and accessible language to those of us in the United States and I neglected it until I was a working professional in Washington DC and started dreaming about escaping the desk life. I imagined trips to South America, backpacking, hiking in the Andes and those sorts of adventures. My interest waxed and waned in Spanish without a definite plan to visit. It wasn’t until the end of last year as my previous big trip was winding down that I knew I would be heading south and needed to start almost all over in Spanish. Fast forward to today, and I can say that I have a pretty strong command of the language. I can talk about virtually anything with native speakers (that are speaking clearly). I’m basically fluent these days after living and traveling so long through Latin America, and I can honestly say that the resources below provided me the foundation to get to this point. First, let me say that there is nothing like having a conversation with a native speaker in order to work on your Spanish and that you should try to start speaking the language from Day 1. But you should also be supplementing it with outside sources of learning. Here’s what I recommend to all of you aspiring Spanish learners when you’re just getting started. This is one of the most amazing and, best of all, FREE Spanish resources that you can use as a smartphone app or the website and which will truly help you build your vocabulary. The method of learning is primarily by translating a word or phrase either to or from the target language. There are tons and tons of lessons grouped by vocabulary themes to work your way through. And there is even an interesting gamified aspect whereby you can link it to your Facebook account and compete against your friends to learn a language. It encourages you to study a little bit every day with nudges and reminders to keep your streak alive. The one big thing I think they could improve would be to stop using vocabulary based on themes (ie animals, colors, etc), but to structure the lessons in terms of actual frequency of usage. There are 10s of thousands of words in any language. But studies have shown that a very, very small percentage of those words actually make up the vast majority of our usage. This is the 80/20 Rule exemplified. We only need something like 1,000- 2,000 words in a given language to be functionally fluent in 80% of our interactions. 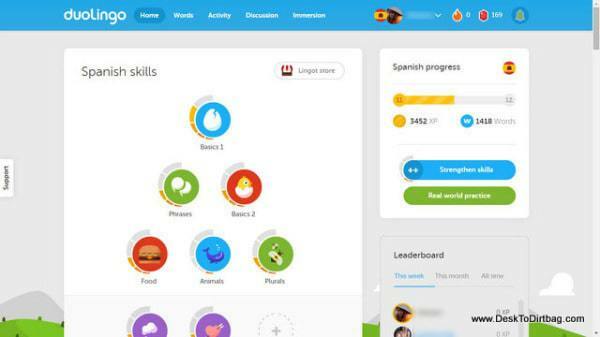 What I especially love about Duolingo is the smartphone app–whenever you have free time (on a bus, waiting for a friend, or whatever) you can quickly do a lesson or refresher. This is huge. I’ve used Rosetta Stone for Spanish and another language, I’d say Duolingo is practically as good but for FREE and is an awesome way to learn Spanish online. Michel Thomas was a prisoner under Nazi Germany, then became a Nazi Hunter, before turning his knack for learning foreign languages into a new teaching career as the “language teacher of the stars” in Hollywood and such. An interesting story in and of itself. I’ve used numerous audio learning programs ranging from Pimsleur audio CDs to Living Language and Vocabulearn. I consider the Michel Thomas Spanish course to be the best of the best when it comes to resources for learning Spanish. And while there are other audio programs, they pale in comparison, and this is the best overall program of those mentioned here. Turn your half an hour commute to work into a learning opportunity. The program he teaches is absolutely great. You will be able to make complex sentences and have a better understanding of grammar and structure fundamentals in a few hours with Michel (honestly). Whereas it will take you weeks (or months) of using Duolingo or Rosetta Stone. They have recently started branching out beyond the Romance languages with offerings in Hindi, Korean, Norwegian and others. The best part of the program, beyond his shortcuts to grammar and structure, are the various “hacks” that he applies to the vocabulary which will instantly give you thousands of words. There are so many different words in English that you can simply modify with the Spanish structure to get the correct word. Once you see the patterns it becomes easy to accurately guess many different words. The only real downside of the program is it is presented as a recording of him teaching two other absolute beginners, therefore you have to listen along as they struggle through some things, which can be a little annoying at times. If your time is limited, I fully believe that Michel Thomas is the quickest and best of the resources for learning Spanish and it will jump-start your language learning. Learning and studying a language is all well and good. But the whole point of language is to communicate. Therefore, from the very first week (or better yet the first day) you should try and speak the language with someone, even if it is just the basics. It can be hard to find opportunities to speak a language if they aren’t readily available in your normal day to day life, so why not turn to online Spanish speaking opportunities? iTalki.com is a great option for finding language partners and then chatting over Skype. You can get matched up with a person that is a native speaker of the language you want to learn, and who wants to learn your native language. Then once a week or so you can get together on Skype to chat half the time totally in Spanish and half the time totally in English. This is a win-win for both parties and is totally free. 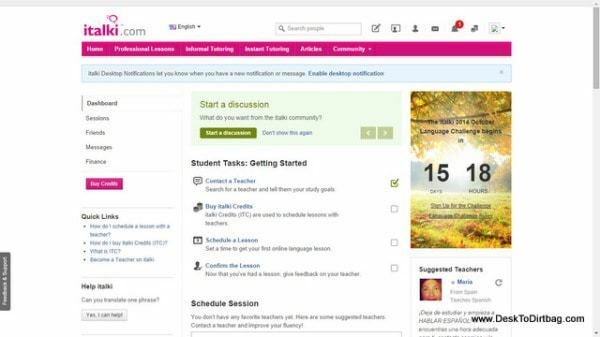 Additionally, there are professional Spanish tutors or teachers on iTalki that you can hire for a modest rate to help you with your language if you don’t have the time to go to classes or would just prefer to work from home. Doing an exchange via iTalki will really put what you learn via Duolingo and Michel Thomas to use right away, which is definitely the most important part. 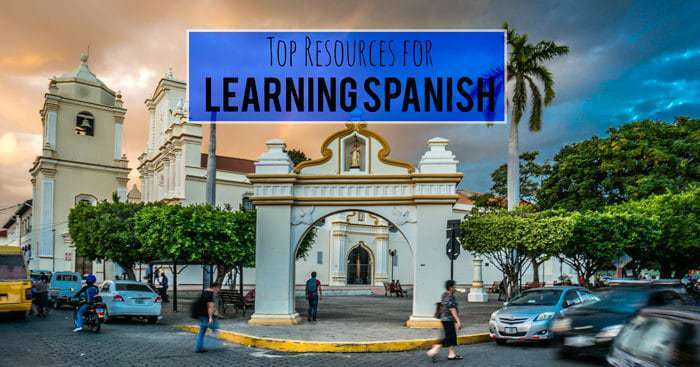 The above three would be what I would consider the best resources for learning Spanish and for someone getting started right now, among the countless free and paid resources available today. Read and Think Spanish book which is just articles with key vocabulary translated on the side so you spend less time with a dictionary. Schaum’s Spanish Grammar book which is about the ever so interesting subject of grammar, but at least allows for independent study. VeinteMundos which has excellent articles in Spanish along with accompanying audio files. Watching familiar and beloved TV shows over again, but with Spanish audio and NO subtitles (try re-watching Breaking Bad on Netflix or some other show that you really like). Nothing replaces the full immersion experience that you get when you hit the ground in a new country. You will definitely learn much more during that time period. But if you have plans to visit a foreign country you should be trying to learn as much as possible beforehand so you can hit the ground running instead of wasting your first days and weeks struggling through the fundamentals. None of the above programs will get you to complete fluency, but I do believe that they will cut your learning curve significantly and put you in a better position to reach fluency. For additional resources on learning a new language and learning a new language fast, you should definitely check out Benny the Irish Polyglot’s website. He has an outstanding book called Fluent in 3 Months which deconstructs some essential tactics in your quest to learn a foreign language. I hope this post has offered up some help as you search for the best resources for learning Spanish. If you have any questions, comments, or other resource recommendations, please sound off in the comments below! I think you’ve absolutely nailed most of the main resources for beginner Spanish learners, especially the Schaum workbook, which I fully endorse. If any of your readers think that they need something a bit more advanced then I can recommend this comprehensive guide https://thelanguagesherpa.com/spanish-guide/ which sets out the best resources for beginner, intermediate, and advanced learners, all neatly arranged and in order. Anyways, thanks for the article and good luck with your future travels! What I’ve been doing lately which was fun and great for building my vocabulary was listening to songs with Spanish lyrics and English translations. I now very rarely listen to English music and just listen to Spanish music! Music is most definitely an awesome way to learn, I remember how much it helped me with vocabulary (and remembering what it really means) when I was just starting out the Spanish as well. Another good one resource is “Podcasts – Spanish Audio Library To Learn Spanish” at http://www.podcastfromspain.com/ They have a collection of audios divided by levels with scripts, question about the audio, vocabulary key and grammar explanations. Feel free to add in your list, if you consider it is convenient . Great resource! Thanks for chiming in!